Shoe Shining Machine rotates automatically and removes dust from the shoe. We are an Uttarakhand-based company, engaged in supplying Shoe Shining Machine. We procure Shoe Shining Machine from the reputed vendors of the market. Our Shoe Shining Machine has a nozzle that is provided to dispense cream polish. 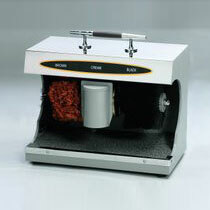 Customers can avail Shoe Shining Machine from us at a very reasonable price.